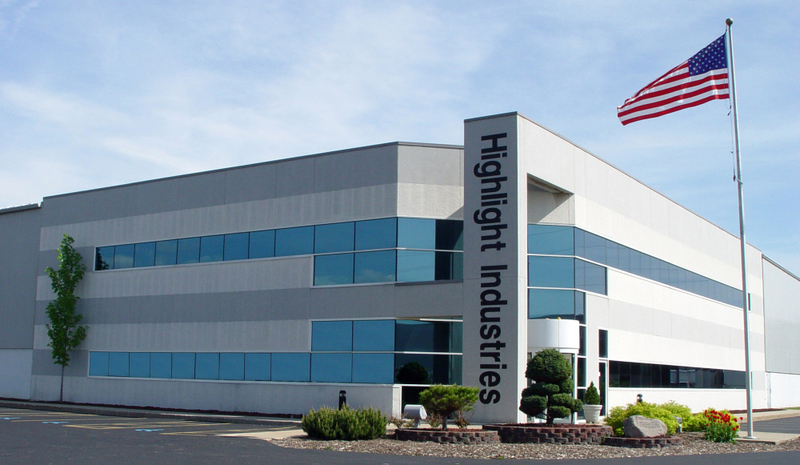 The History of Highlight Industries, Inc. In the basement of Kurt and Karen Riemenschneider's Grandville, Michigan home, a small idea was beginning to grow. This idea was to create a unique and superior line of stretch wrap equipment. At the age of 31, Kurt received his first patent for his invention called the "Highlight Handwrapper." With patent in hand, Kurt decided to enter the industrial packaging machinery field. Highlight's modest goal at this time was to produce and sell 20 handwrappers a week. Soon, with the added help of four employees, Highlight began to blossom. The spring of 1981 gave birth to the company known today as Highlight Industries, Inc. The company quickly outgrew the Riemenschneider's basement. 1983 saw the expansion of Highlight out of the basement and into a rented building in Wyoming, Michigan. With the additional room and six more employees, Highlight expanded its production line to include powered machines, namely the Synergy and Revolver. Highlight was recognized as "One of the Top 100 Fastest Growing Privately Held Companies in the State of Michigan" in 1989, 1990, 1991 and 1992. However, to maintain this level of production Highlight needed more room. In the summer of 1997 Highlight built a new multimillion-dollar building at 2694 Prairie Street in Wyoming, Michigan. The new plant is equipped with state-of-the-art manufacturing machinery and staffed with the best people in Michigan. We are Highlight Industries. We engineer and build end-of-the-line packaging solutions. Our products range from manual handwrappers and hand tapers, to semi-automatic and automatic packaging machinery in many sizes and shapes. Highlight's Mission is to provide the highests quality, highest value, highest technological products to our customers, by encourging everyone at Highlight to use and improve their abilities to achieve their highest potential. Highlight designs and builds more custom packaging solutions than anyone else in the world, and we are the world leader in stretch film testing technology and equipment. There is no product that we can't package and no packaging problem we can't solve.